These Blank 3-Per-Page Laser Wallet Business checks have a basic plain back ground in eight different colors. Their profession design goes nicely with your Quicken or other compatible software programs, offering small businesses an affordable line of checking account products. 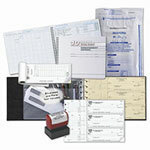 They also offer easy to use record keeping on a left stub with perforated lines made for easy tearing. Keep your business accountant happy and order your Laser Wallet, Blank Check Stock today.